In 2016 some Alaska Natives experienced something years in the making — the choice to use an election ballot in their primary language of Yup’ik, Inupiaq, or Gwich’in. “When people heard (about the changes) they got a lot more excited to be a part of the process,” an interpreter explained for Mike Toyukak as he voted in Alaska’s primary election. Mr. Toyukak lives and votes in Manokotak, Alaska and was a part of a lawsuit filed in 2013 resulting in Alaska providing election language assistance for 29 communities through 2020. Apart from litigation, there is another routine process designed to give federal protection to large groups of people needing language assistance. This month, the Director of the U.S. Census Bureau released updated determinations for required language assistance coverage under Section 203 of the Voting Rights Act (VRA), replacing the last set of determinations made in October 2011. The new determinations increase the number of states covered, at least partially, from 25 to 29, and includes, for the first time, areas of Georgia, Idaho, Iowa and Oklahoma. This may be a big shift for some of these jurisdictions. Moving forward government officials will be looking for best practices and next steps as they chart out what compliance will look like. For some it could even start with the fundamentals: what is this requirement and why it is important to their voters? Currently, over 25 million U.S. residents have limited English proficiency. While ballots can be complicated and confusing even for proficient English speakers, those with limited English proficiency face more difficulty. In 1975, Congress amended the VRA to give these voters some relief and reinforce their value in our representative democracy by adding Section 203. This section mandates making voting materials and assistance available in languages where a community meets a certain threshold, and the language falls under Spanish, Asian languages, American Indian, or Alaskan Native languages, like the one used by Mr. Toyukak. Newly included Section 203 jurisdictions must develop a comprehensive language assistance plan over the next year; determining which dialects to cover for both written and oral language assistance, and deciding how to tailor the assistance precinct by precinct. As part of this comprehensive plan, a translation workflow will need to be created, including actual translators — not just a computer. In this regard it is essential to engage community leaders in the review process to ensure all materials are informationally and tonally correct. Jurisdictions must be proactive in recruiting the necessary workers to staff polling sites. And poll worker trainings should have a strong emphasis on language assistance and the existing laws that protect language minority voting rights. Election officials should reach into diverse segments of these communities, talking to business owners, teachers, religious, and civic leaders. This will put officials in the best position to formulate sound policies and tap into networks to recruit bilingual poll workers. To this end, jurisdictions should put in the time to create culturally aware outreach programs and engage these voters year round — not just around election time. In an ideal scenario, an office would dedicate a full-time employee to be a liaison to respective language communities. Ultimately, these partnerships can help jurisdictions formulate their language plans by providing them with on-the-ground intelligence and experience. A key takeaway from jurisdictions that have been under designation for some time now is that they are most successful in complying with the law when they regularly engaged local leaders. This allows them to ensure that materials and information are conveyed to language minorities effectively. Alaska officials have said they stand ready to engage with more tribes after the U.S. Census Bureau recently expanded Alaska areas in the new designations from eight to 15, which advocates have pointed out nearly replicates the statewide coverage that existed under the Section 4(f)(4) of the VRA. This increased coverage communicates to voters like Mr. Toyukak, that they are valued American citizens and they must be afforded their language rights. 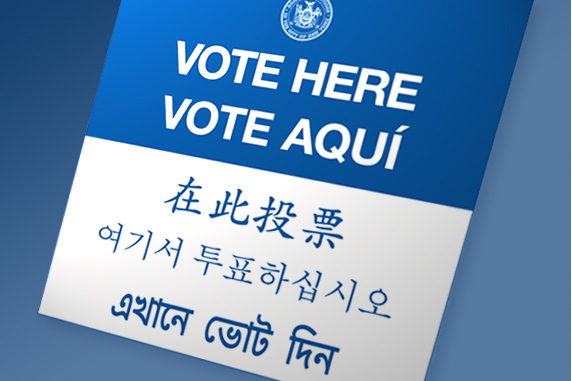 Overall, the underlying standard for effectiveness of Section 203 compliance is whether voters using language services and exercising their language assistance rights are able to participate in the same manner as voters who are fully fluent and literate in English. Democracy Fund remains committed to helping jurisdictions achieve this level of effectiveness and encourage officials in newly covered jurisdictions to use the resources and information produced and collected by the U.S. Election Assistance Commission, available at eac.gov. While not every jurisdiction will have the resources to implement every suggestion here, the basic ideas – constant engagement, cultural awareness, plain language and user-focused design – are crucial to success. Thanks to Terry and Stacey for writing this important post, and to the Democracy Fund for its ongoing efforts to improve the voting experience nationwide. Be the first to comment on "New Democracy Fund Blog Post with “Tips” on Section 203 Implementation"